Young people are better informed and work ready through 50-50 PAD. It helps them to develop and embed key work related skills. We are developing the 50-50 Profile and Attitude Development (PAD) system. The personal development system helps young people to improve in their attitude and aptitude towards undertaking and completing duties and tasks in the workplace. It instils a good work ethic by embedding work related character skills, attributes and values. 50-50 has created an individualised points-based system to measure the level of effort a person applies towards tasks. The process is used to help measure the work-related capabilities of an employee and where they need to improve. The system is quite simple. The employer or designated lead will complete the 50-50 PAD matrix form for an employee or apprentice. All sections must be completed. This is based on the employee’s or apprentice’s performance during an agreed period e.g. termly or quarterly, to allow the person to work through whilst displaying an improved demeanour and producing evidence of progress before the next meeting. The person who is being monitored also gives themselves PAD scores on the matrix form. They may write some examples of why they’ve given specific scores. This is all work related and based on their placement or employment. Once the form is completed both parties meet and go through each area. They agree a PAD score via conversation where examples are given. This process is designed to ‘on-board’ staff members and identify and work on areas which are deemed as Emerging. 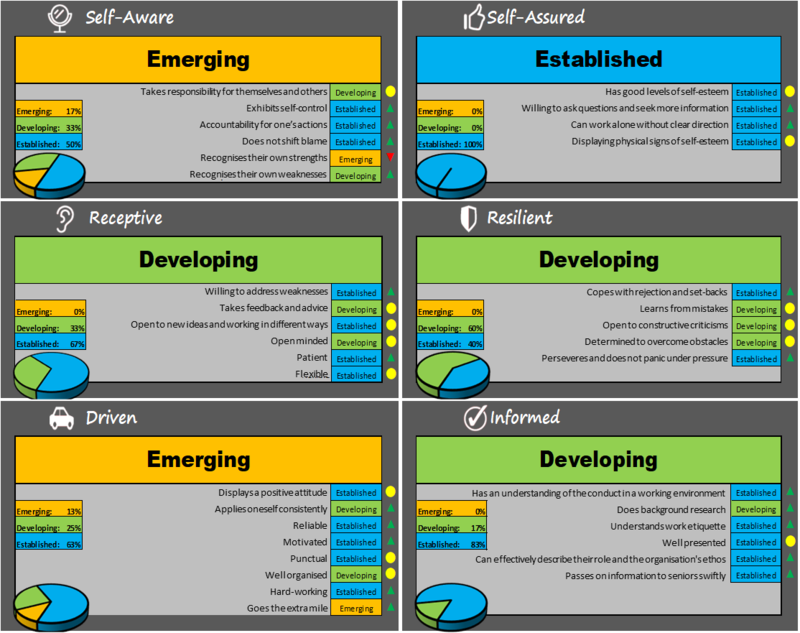 The progression pathway enables the person to move up or down between Emerging, Developing and Established in each identified area. In each of the 6 sections, if one element is Emerging the whole section remains Emerging until the person works to turn this element around. The process is confidential to the individual and gives them the opportunity to focus on areas to improve in their Profile and Attitude Development.